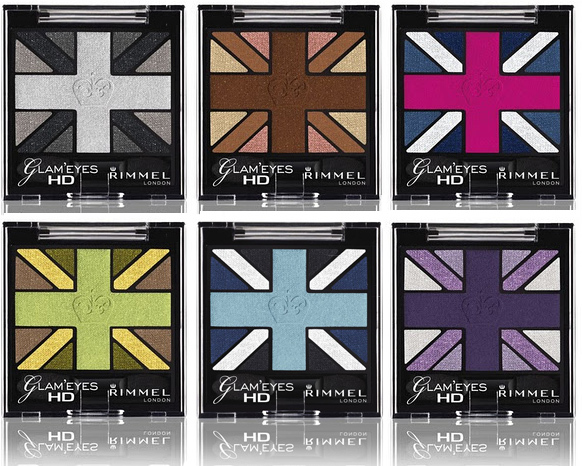 Today I’m going to be showing you swatches of the Rimmel latest eye shadow palettes the Glameyes HDs. 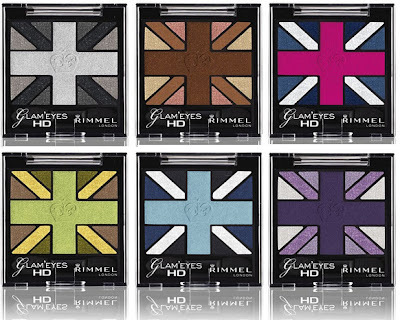 This eye collection is a collaboration with Kate Moss who provided the inspiration for the so cute design of the Union Jack strips to house the different colours of the shades in the palette. Although the design is beautiful, it is quite unpractical as the small triangle wedges and thin strips of some of the shades make it very hard to pick the colour up with your regular eyeshadow brushes without contamination the bristles with its neighbouring colour. This is where you really need the sponge tip applicators which are more precise to pick up the product from the pan. That design flaw aside, the product is beautiful. The colours all have a pearly finish that gives just the right hint of shimmer in all lighting without being overly glittery. They are soft, smooth and the colour pay off is quite high with minimal fall out during application. They don’t feel chalky, blend well together without going muddy and are pretty crease resistant lasting 3 hours on my oily eyes before I start to see creasing along my semi hooded lids. English Oak is a neutral beige/brown/pink combination for soft pretty everyday wear. 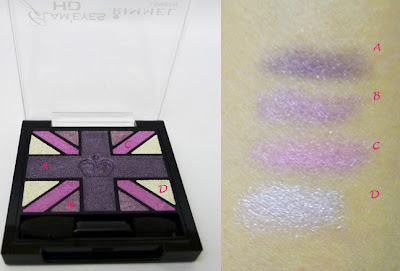 True Union Jack is a bold navy/blue/pink/silver combination that would give striking party looks. Green Park is a gold/olive/mustard combination for would complement brown and green eyed beauties. Royal Blue is a grey/silver/dark and light blue combination that works well with both blue and brown eyes. Purple Reign is a silver/mauve/purple grouping that gives a pretty day or night look depending on the intensity you apply these shadows with. 04 Green Park -the gold (d) is one of the best I’ve seen, it gives just the right warmth. the mustard greens (a & b) are also unique shares that are not often seen in other palettes. 06 Purple Reign – my favourite shade from this quad is the mauvey pink (c) and silver (d). 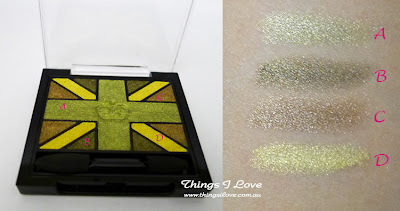 This Rimmel Glam Eyes HD collection may be the best eye shadows from Rimmel yet. Now I just need to dig out my sponge-tip applicators so I can apply them precisely! RRP A$15.95 each at Priceline, Coles, Woolworths Kmart, Big W and David jones and selected pharmacies. This review featured samples provided for consideration. They all looks so pretty! I'm not too much of an eyeshadow-person though! But I've been wanting to try the Rimmel Kate Moss Lipsticks! but it is a pain to pick up the fine stripped colours - they're no used in 4 quadrants being so small without using special fine brushes. Tram - I need to get moving on swatching those Kate Moss lipsticks too so I'll let you know soon! These are so gorgeous! I want them all!! Im not an eyeshadoe kinda girl but these are lovely colours :) I especially love the greens on my skin tone - Thanks for the post!